Explore Tweed waterways with this 3 hour package. Enjoy a guided kayak experience on the Tweed and Rous Rivers at Tumbulgum. Experience the natural beauty of the Tweed Valley on the Spirit of Wollumbin. Explore the majestic Tweed River whilst taking in the mountain views & enjoying a glass of Australian wine. ​PLUS Enjoy a local seafood meal. Treasures of the Tweed - Full Day Food, Farm and Culture Tour. Visit the Tweed Regional Gallery, House of Gabriel Cafe, Tweed Regional, Museum, M-ARTS, Bucks Farm at Chillingham, Flutterbies Cottage Cafe at Tyalgum and Caldera Wildscapes. Experience a relaxing two hour river and rainforest cruise including bird watching and feeding, local seafood & wine on the scenic Tweed and Rous River’s. The tour departs from historic Tumbulgum. Full Day Tweed Villages - Historic Caldera Villages Sightseeing Tour. Gather at Tumbulgum the historic meeting place of the waters, to do the Tumbulgum Heritage Trail, before heading into the heart of the Tweed Vallley and its villages. 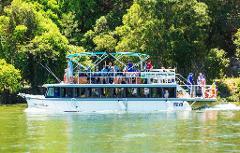 Experience the natural beauty of the Tweed Valley on the Spirit of Wollumbin. Explore the majestic Tweed River whilst enjoying five Local Seafood and Tweed Valley Local Produce Tasting Plates.